All feedback regarding the loot for the Survival game-mode goes here. How about adding tactical weapon crates to survival? it would contain some very rare things obviously and it would be very rare itself. Also, adding AK-12 (maybe a bit nerfed) to survival wouldnt be a bad idea as well. It would add some new content to survival. Make compact scopes more common and add more loot variations inside the car wrecks. 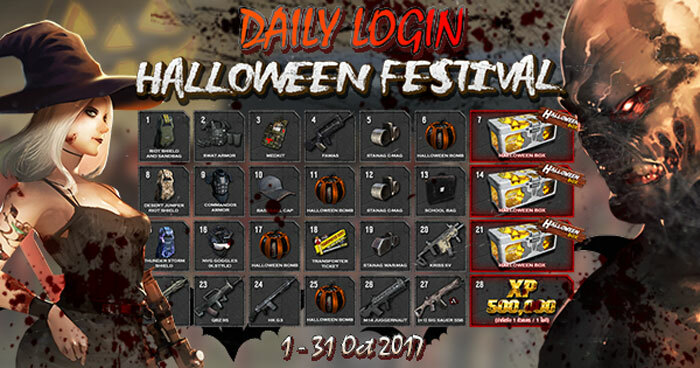 daily login like in iss th where every next day you will get better items. Decrease the bandage and Pain killer drop rate from zombies!!!! Military Areas are to easy to farm Stanag, every corner you look a M16 appear!! Every Stryker on roads or Military Areas have a M9 NVG, maybe drop the rate!!! Suggestion: Add more craftable Itens...better itens! Add zombies as it was before the patch same drop from zombies. Air drops still dropping zero items or in some cases nothing but a DX. Please make these worthwhile. Just had one drop nothing on Oregon Survival. These are all great ideas. With Survival, though, we need to tread carefully as to not overdo it with the loot and make items too common. And about what @Arowskysaid, we are already starting the idea with the events/missions. Alien super zombie drop only 1 item, should it be like that? Its not even worth to spend those hundreds of bullets for only a sig or k. style. Decrease OREGON loot, or R I P Survival mode !!!! Where did you find the Alien Super if I may ask? I think its already been decreased. The private server I joined has about half the loot that was on it last night. The one issue I still see is no zombies in places like Prison and Army Base. Seems to be too many Pill Cases, which are fairly useless with all the other meds around, and large amount of Soup everywhere... lots and lots of Soup! We are aware. Will be fixed upcoming patch. I am going to look into this right now. More variaty of attachments coming soon! Thanks. I'll reduce the soup a bit! Guys, can you all also type what MAP the feedback is about? This helps out a lot. Buffed the loot from random airdrops in both Oregon and Colorado. Airdrops now drop 6 items instead of 4. Release a "Real Survival" option!!!! Yes!It is necessary to start all over again! I want the players to play with the krugers, hammers as before.The military loot should spawn on military bases or points.But rarely. In order to usually find m16, m4.Sniper rifles should also spawn but rarely. I don't want them to just fall from a super zombie. When you find a sniper rifle on the ground or a box, then this is another feeling. You need to add Item Boxes.Add a rare loot from WARZ.Listen to survival players. A stupid pvp is very annoying. When everyone has weapons, etc.Add a lot of zombies like in WarZ! I dream of such a game. But what now I really don't like. I do not care what I lose, but I'm ready to start the game anew with a rare loot. "Survival are suppose to be dificult..."
Difficulty is a term for everyone different. Some players think some things are more difficult than others. ^ I am very serious. Don't see any added value in why you are typing this. ^ Did you even see the reason? Do you even know how rare airdrops were? Do you know they don't come often at all and are very hard to get? Did you know they were literally NOT worth it to go for at all? Sorry I made players happy. If you think it's unbalanced you should maybe join a server and figure out for yourself. "Oregon with places to loot without zombies..."
^ Is an issue. Will be fixed upcoming patch. Did we patch yet? No. So it can't be fixed yet. "AR's and their ammo to easy to find...."
^ What map? When was this? What Ammo? Do you want me to just smell? ^ I already mentioned around 72 times that this was never intended to be like this and will be fixed upcoming patch. Did we patch yet? No. So it can't be fixed yet. Since there is no appropriate section for this, i'll post it here. So, I have an idea. When seasonal leaderboards event comes, maybe you could make, that instead of boxes we get some rewards in survival? Antis, customs, snipers, lockers, dxs, guns, attachments or anything else. What is your feedback? (Please be specific): I've been killing alien super zombies non stop for the last few day in Oregon survival. I must have killed 20+, and while it drops 2 items, I am noticing it is no better (in some cases worse) than normal super zombies. I think the alien zombie which is a rare spawn and takes so much ammo should provide more rewards than normal super zombies to give players some incentive to kill them. Ive also noticed that they do not always spawn at 10pm. Do they randomly spawn between 10 and 4am? Write extra info here: Maybe I have just had bad luck but the loot from the Aliens just not been as good as normal supers. What is your feedback? : Versek SMG it's not able to be attached with Silencer or The Cleaner. DOn't know if it's mean to be like this now or some bug, since the patch news say nothing about adding a new attachment for this type of weapon. What map did you experience this? : Colorado.